From ancient aqueducts to modern designer kitchens, moving water to where we need it has always been a huge deal – a steady supply of clean water being necessary if we’re to do anything at all. Likewise, keeping waste out of those supplies and removing it from living areas is our first (and best) chance to prevent disease outbreaks. These are the fundamental duties of the plumber. The first plumbing systems were things of pure necessity, with little view towards anything but immediate function. Centuries of trial and error have produced the sophisticated and efficient systems many of us enjoy daily, without a thought. We’ve discovered how water is contaminated, and virtually eliminated waterborne disease in many parts of the world. A once unthinkable standard of living is the norm, and countless lives have been saved. It’s pretty impressive. But plumbing systems need experts – people who know how to design them, build and install them, and keep them working. It’s not just about connecting pipes and clearing blockages! Licensed plumbers have been thoroughly trained in the theory and practice of plumbing; from how water behaves in a system, to materials composition, to construction practices. All this so you can enjoy a flushing toilet and a hot shower! So, if you didn’t have to walk several miles to collect water in a bucket today, didn’t have to defecate in the open, and haven’t lost a loved one to a waterborne illness… why not show your thanks to those that make it possible, day in and day out? Though modern western culture has for some strange reason devalued plumbers, the truth of the matter is clear: a society functions at its best only if it has an adequate plumbing infrastructure, and good plumbers to construct and manage it. 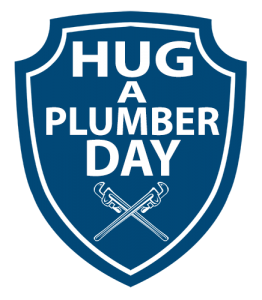 Hug a Plumber Day is a silly “holiday”, but the sentiment behind it is anything but. Be it a tip of the hat, a handshake, a beer, or a full-on bear hug, it makes sense to show some gratitude and respect to the workers that help keep us healthy and productive. 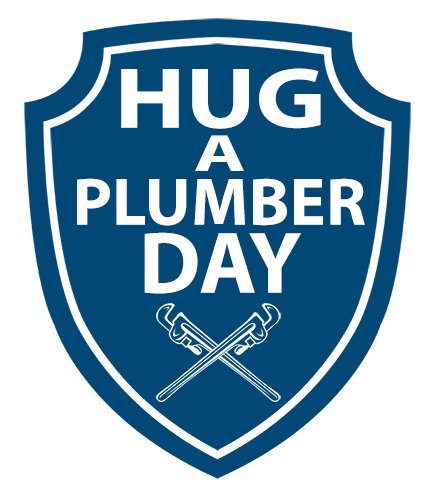 A big THANK YOU to all plumbers!